The United Kingdom has been entertaining the public with its amazing selection of parks and roller coasters since the late 19th century. This book features in-depth profiles of 80 roller coasters, from the 7,442-foot Ultimate in Lightwater Valley to Thorpe Park's Stealth, which goes from 0 to 80 mph in 1.9 seconds. 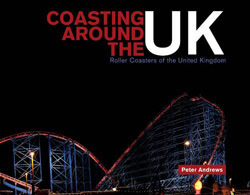 A compelling series of photographs, gathered from 38 of Great Britain's most famous amusement parks, includes many behind-the-scenes perspectives and rare views that prove these compelling structures are not merely fun rides but also mechanically magnificent and, at times, visually stunning machines. Covering the length and breadth of the UK, this photographic and historic guide takes you from Brighton up to Glasgow, and from Gwynedd over to Great Yarmouth and provides the ultimate adrenaline rush. This book is absolutely brilliant. It was actually purchased from somewhere else but I’ve had a read of it today and I love it. It will be a book that I will read for days, months and years to come.